Class participation in law school can be nerve wracking- you never want to say the wrong thing and make a fool out of yourself but you also know that participation factors into most grades so you know you need to raise your hand at some point. Undergrad was easy- usually participation wasn't a big deal and if you did participate, it was low stakes, opinion based or easily found in the homework. Law school is completely different. Professors expect a well reasoned, thoughtful contribution to class and whatever you say you better be able to back up with some black letter law or case facts... otherwise you may embarrass yourself when the professor shuts you down in front of the whole class. I know some of my friends just refuse to participate unless they are forced to via cold call and other people in my class never seem to shut up. I try to find a healthy balance and participate when I have something meaningful to say or I have a question. Still, it is a bit stressful in the beginning but there are ways to make it less scary. Here are my tips for properly participating in a law school class and making a good impression while doing it. I know I have expressed this a million times but I will say it again: DO THE READING. This is seriously the holy grail in law school. You have to read. There is nothing worse than listening to someone get cold called or try to ask a question and it is blatantly obvious they did not read. It just makes me internally cringe. If you do your reading, you will be able to follow what is happening in class and handle any cold calls that come your way. Paying attention in class will help you to stay up on the discussion and keep you from making a point that has already been made or asking a question that has already been answered. If you pay attention in class and do the reading ahead of time, it is significantly more likely that you will have something thoughtful to lend to class discussion. Always, always, always be respectful when speaking in class. There is just no reason to not be. Be respectful to the professor, the other students and anyone else who happens to be present. You do not want the reputation of being that person who made a nasty comment, talked back to the professor, etc. It is great to be involved and to significantly participate in class discussions but there is a balance. You do not want to take over the discussion and be the person who answers every question or asks a million questions. It will annoy the professor and it will also highly annoy other students. Also, stay on topic- do not bring up unrelated information or try to get the professor off track. Most of the students want to learn the information being presented; not listen to a digression about who knows what. Nothing is more annoying than someone who whispers, mumbles or you generally cannot hear and understand. It is hard to follow a discussion when you can't understand the person talking and I am sure it is frustrating to professors when they have to strain to hear students talk. So speak up, speak clear and make yourself heard. After all, you won't be able to get away with that in a courtroom so start practicing now. I know a lot of people who do not want to participate in class because they are afraid of how other people will perceive them. Personally, I don't care too much what other people think of me. But I know that not everyone is like that. Though it will be hard, you have to remember that everyone is in the same boat, likely thinking the same thing (1L's) and you have to do what you have to do to learn. If that means asking questions, do it. If that means discussion helps you to understand, get that hand in the air. People don't usually get too caught up in what people say in class unless it is: disrespectful, obvious you are not prepared or hard to understand. Steer clear of that and no one will pay you much mind. If anything, they will probably be sitting there impressed that you spoke up in class- not a bad thing either. Take a second to phrase the question or comment in your mind before raising your hand. This way, when you speak, it sounds more thoughtful and makes more sense. Making a well reasoned and eloquently presented question or comment will be all the more impressive to your professor and classmates. It's only a big deal if you make it one. If you just relax and don't stress, it will all go smoother. There's just really nothing to stress about participating in class if you are prepared and have something compelling to say. Do not over analyze everything you say after class. You will drive yourself nuts. Just speak your piece, ask your question, take notes on it and move on. In the long scheme of things, it just doesn't matter. Just like with anything, practice makes perfect. The more you speak up in class, the easier it will become. Also, the more you speak in class, the more likely the professor is to take note of your participation and that never hurts come grading time. 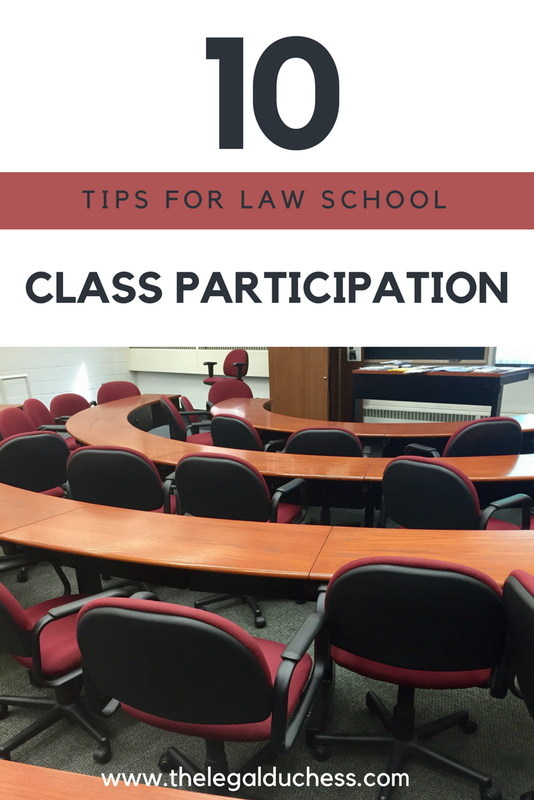 Class participation is a big part of law school classes but it is only a stressful, big deal if you make it one. Be respectful, make thoughtful comments and speak clearly and you will be good to go!